As the city gasped for air yesterday, the economic fallout of the haze threatened to choke businesses. Consumer-driven industries were the first to get hurt, with the taxi business seeing a 25 per cent drop in the number of commuters. "The livelihood of taxi drivers has been directly impacted," the National Taxi Association sombrely noted yesterday. The Singapore Flyer, already under receivership, cut an even more woeful figure yesterday, when it suspended operations. "The health risks posed by the haze have led us to close the Singapore Flyer for the time being to protect staff members, many of whom work outdoors," said Tim Reid of Ferrier Hodgson, the Flyer's recovery firm. At a press briefing yesterday, Prime Minister Lee Hsien Loong raised the possibility of the haze lasting for as long as three or four months - the length of the dry season in Sumatra where forest fires are raging. Companies will not be able to take much more of this, warned Victor Tay, chief operating officer of the Singapore Business Federation. "(The haze is) disruptive to business operations, and there will be serious environmental, financial and economic implications if the situation persists," he said. The last time haze beset Singapore for three months in 1997, it cost the country almost US$300 million, according to estimates by an expert on the matter, Euston Quah, head of NTU's Department of Economics. Extrapolated to the current situation, the haze is costing Singapore US$3 million a day, before accounting for inflation. Of that sum, the tourism industry's loss forms the bulk: US$2.34 million. Another US$50,000 a day is lost on health costs, which includes direct costs, self-medication expenses, loss in productivity and preventive expenditures. A surprising US$791,000 loss per day is caused by the loss of scenic views, visibility and recreational activities. Even so, these figures cannot be wholly transposed to fit the current situation - at least not for now, Prof Quah stressed. "The 1997 one lasted three months. This one is just starting. So we have to wait and see how prolonged this is," he said. But if this particular spell lasts three months and has a higher average PSI reading than in 1997, Prof Quah's numbers will actually be an underestimate. Earlier this week, the PSI soared past the all-time 1997 high of 226, setting new records yesterday afternoon. Other experts, while not dabbling in the business of estimates, are certain that this haze period will cost more than the 1997 one. "The pollution is more severe (and) the economy and populations are larger. So more businesses and people are victimised," said Ivan Png, professor of strategy and policy at NUS Business School. Already, businesses are chalking up haze-related costs. Companies and banks such as SingPost, CapitaLand, United Overseas Bank and Keppel Group are giving masks to their employees. And then there is the equipment. ANZ has hired additional air purifiers for all its offices and branches, while OCBC and DBS have opted to install carbon filters in their buildings. Even as firms make their premises safer, many have sent workers home. Yesterday, more than 750 employees at Bosch were given the option to work from home, while Allen & Gledhill staffers headed home at 4.30pm. At SingTel, staff have the option of using flexible work arrangements such as telecommuting. "This week we have observed an increase in companies . . . deploying flexi-work arrangements and encouraging their staff and customers to stay indoors," said Brad Gray, a regional director at Polycom Southeast Asia, which specialises in video conferencing. Smaller companies were also quick to declare yesterday a work-from-home day. Start-up firm KidStartNow, for example, will have its four-person team working from home over the next few days. While the firm is getting by with Google Docs and Skype, co-founder Dan Tang conceded that this will not be ideal over the long term. "The best interaction happens when you're directly talking to each other," he said. Prizing employee welfare carries a trade-off. This weekend, StarHub will suspend activities happening outdoors such as roadshows if the air quality continues to be in the unhealthy range, it said, while McDonald's, Pizza Hut and KFC suspended delivery services from yesterday. For observers, however, this is set to be part of the cost of doing business. "At the end of day, it's not about contracts . . . it's about doing the right thing. We are facing not just higher absolute cost, but reputation and confidence costs," said Annie Koh, vice-president of the office of business development and external relations at SMU. The haze also cast a shadow on the shipping and aviation sectors. Seletar Airport diverted two arrivals to other airports and cancelled eight departures because pilots couldn't see the runway clearly. "Air transport and sea transport may be reduced or put to a halt due to severe haze and this will disrupt the transportation of output," warned Tan Khay Boon, senior lecturer at SIM Global Education. Even as businesses struggle to come to terms with this week's hazy trials, the fundamental problem of a lack of preparedness risks being neglected, said Janson Yap, regional managing partner of Deloitte Southeast Asia Enterprise Risk Services practice. "My worry is that once this is over, people will go back to business as usual. The principle of continuous monitoring and enforcement must be carried out," he said. 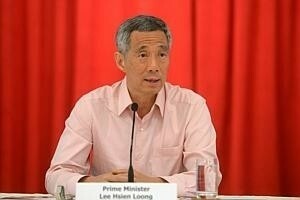 But for now, in the words of Prime Minister Lee yesterday: "Life must still go on."